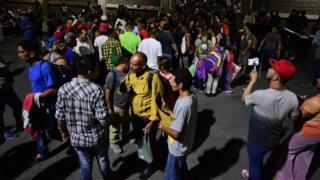 But those gathered at the bus terminal in the crime-ridden city of San Pedro Sula told reporters they were not deterred by Mr Trump's threats to close the border with Mexico. "I'm not afraid," one woman told CNN in Spanish. "When you set yourself a goal and you trust in God then you do everything to get there and in my case, my goal is to get to the US."